The Stylish Way to Advertise! 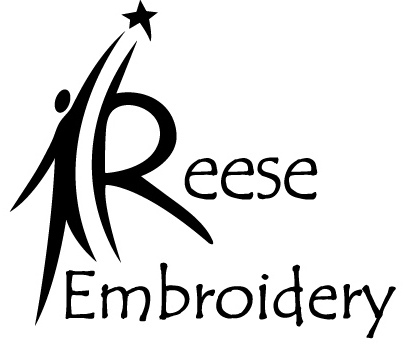 What We Do - Reese Embroidery has been owned and operated in central Wisconsin since 1999.
and excellent customer service. We understand the needs of small businesses, clubs, and organizations. We will often visit you to get a real idea of your needs, show you samples, and deliver your order. We offer no minimum embroidery and we usually deliver in about 2 weeks (depending on quantity, design needs, and time of year). These are all important benefits to a small business owner or manager. We have many customers in the construction trades, banking institutions, and automotive trades. We have also provided design and embroidery services to school, fishing, and classic car clubs. Just to name a few. If you are not already one of our satisfied customers, you are welcome to join the growing list! How We Do It - We start with offering the finest and widest selection of products available. Whether your looking for American made work wear, durable or unique fabrics, or just some good ideas, we can help. We've embroidered on hats and caps of all shapes and sizes. We will also add embroidery to items you bring to us. embroidery machines. Images of your design can be printed and emailed to you for approval. We have a full stock of embroidery threads to match your color schemes. great for event or give away items. They have the ability to duplicate any design without limiting the number of colors used. On light colored shirts, they have a soft feel and machine wash with minimal fading. We also offer traditional screen-print services for quantities of 12 or more, an excellent choice for dark colored items. Updated techniques and loads of experience give the final product the beautiful and professional look you deserve. The best part - our work is guaranteed! If you feel our work is not what we promised, we will replace it, fix it, or refund your money for that item. Your privacy is important to us! We promise not to sell, barter, distribute, or transfer any information submitted.